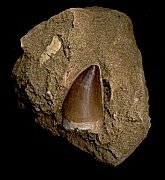 Here is an excellent specimen of a Mosasaurus anceps tooth. This well-defined specimen is from the Cretaceous of Morocco. This large marine lizard tooth is very robust and exhibits fine detail. The corrugated enamel of the tooth is just wonderful. The tip of the tooth displays almost no wear, which is quite unusual. A small portion of the root of the tooth is present, which is also rare. The fossil has beautiful natural color and contrast, and is wonderfully showcased on the large, natural block of sandstone matrix. This is a large, displayable tooth from this famous Cretaceous sea monster.